When I'm buying something for myself, I'm all about a good deal the majority of the time. Nothing gives me a greater thrill than buying something I've been lusting over at 1050% off and then running home to tell Ryan how much money I "saved" (aka, "Ryan, today I spent $30, but I could have spent $100 if I wasn't so thrifty. Are you proud of me?"). However, with that being said, there are just a couple of things out there I don't like to skimp on. These are my investment pieces that I know I'm going to be using for years to come, and I manage to swallow the price tag when I consider how much of a staple they will be in my daily life. One of these investment pieces is my work or school bag. I'm guaranteed to be carrying this bag for at least 5 days a week and likely for a couple of years at a time. All throughout undergrad and graduate school, I carried the same black Longchamp. Oh boy, do I love that bag. After 5 years of heavy lifting, I decided to lay my Longchamp to rest aside from occasionally using it as a purse or carry-on, and the week of my MBA graduation, I took a cue from Tommy Haverford and decided it was okay to treat yo' self. This is when I purchased my Tory Burch bag for my first, official big-girl job. Before I pulled the trigger, I put a significant amount of research into the options out there for a working girl like myself. Today I'm sharing with you a few of my favorites and the reasons why (or why not) I liked them. Lo and Sons is known for their minimalistic, functional bags, and I love The Brookline laptop bag. Not only does it have plenty of pockets and compartments for all of your electronics and work documents, but it also has a sleeve that makes it easy to attach to your carry-on. GiGi New York is always a go-to stop when looking for handbags. 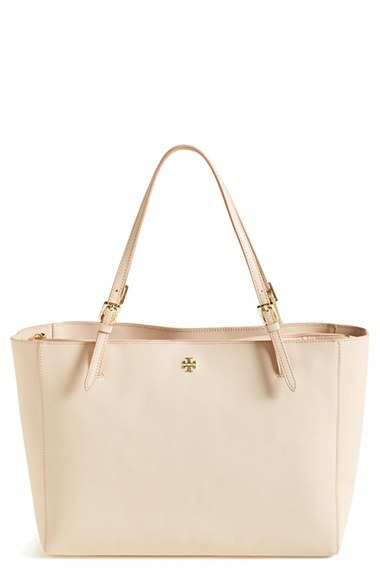 Although I'm typically attracted to their crossbody bags, this Teddie Tote makes the short list. My only complaint is not enough pockets for organization. The shape of the Teddie is all business, but the python leather is too fun to pass up. Kate Spade will forever be one of my favorites. 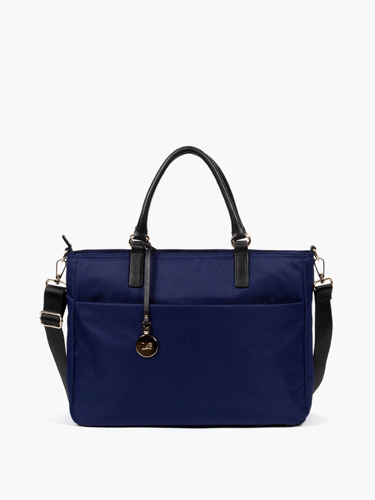 While slightly less practical, this shade of blue on the Cedar Street tote is totally swoon-worthy. My only complaint is again, yup, you guessed it--this girl needs more pockets! Tory Burch is the queen of classic bags. This York Buckle Bag just happens to be the tote I'm currently carrying. I can speak from experience that the padded laptop sleeve is completely clutch when I need to carry my computer home, and there are plenty of organizational features to suit my needs. No complaints yet! Longchamp, a staple in any girl's wardrobe. I make up for the lack of compartments in the Le Pliage by using a few little pouches that help me organize tiny things I might be carrying, like pencils or cosmetics. The nylon is stronger than you think and super convenient when you can clean up almost any stain with a damp cloth. Dagne Dover has all of the pockets. It is any organizational freak's fantasy. Water bottle holder? Check. Laptop and tablet sleeves? Check and check. Lipgloss compartments? Triple check! The 15 inch tote has one of the smartest designs out there, and I'm constantly on the brink of making one mine.